These bollards are senseless. The intent of bollards is to prevent unauthorized encroachment of motor vehicles on trails. Since these bollards are not at the intersection of a street and a trail, they do not serve their intended purpose. It's not clear what the purpose is, other than to create an impediment and hazard to trail users. I observed a mother with two young children attempt to navigate the turn off the W&OD onto this bridge the other day. The young, inexperienced cyclists did not strike the bollards, but I could see they made them nervous. Watching that, it is an absolute certainty that less experienced riders are going to strike these bollards and fall down at some point in the future. One of the bollard's base, in fact, appears to have already been struck by a cyclist, as shown by the markings in this photo. Because the bases are bolted to the ground, striking one is almost certainly going to result in a fall. It appears that the bollards on the east end of the bridge are actually out of compliance with ADA (Americans with Disabilities Act), due to the spacing between them. This week, two additional bollards were installed on the Four Mile Run trail where it goes along next to Dominion Hills Park. I live a few hundred yards from this trail. There has not been a bollard at the corner of N. Madison and the trail for at least a decade and I am unaware of any vehicle encroachment ever occurring. In the photo you can see a patch where a bollard was wisely removed many years ago. 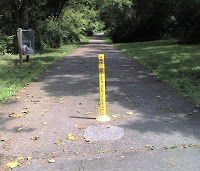 Yet now a bollard has been placed, making the turn onto this trail difficult and hazardous. This trail is frequently used by people teaching youngsters to ride bikes, because it is much less busy than the nearby W&OD. It seems almost cruel to place an obstacle in the path that will undoubtedly be crashed into by some young cyclist. I am unaware of any "documented history of intrusion" at any of these locations. No bollards should be placed anywhere until it is determined that the risks of injury posed by them is outweighed by the benefits of deterring encroachment. 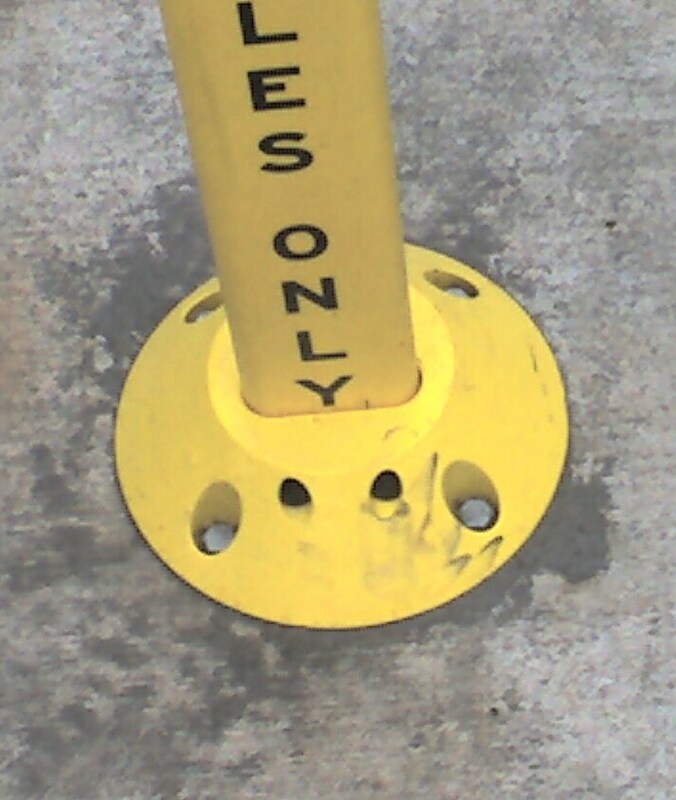 Unjustified bollards can create liability exposure. 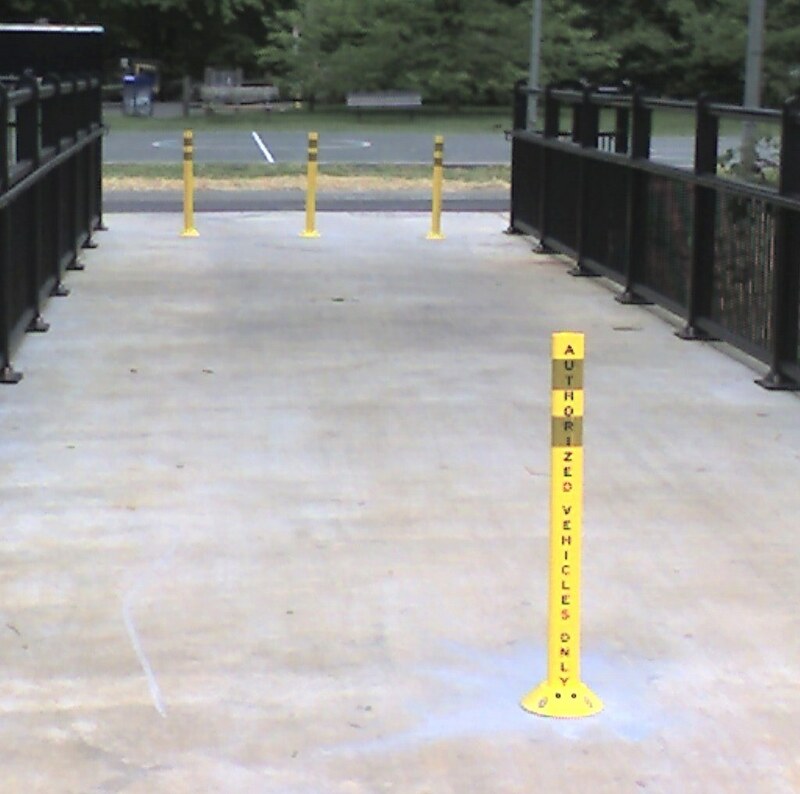 Trail managers should consider whether or not they increase their liability if they install bollards, gates, fences, or other barriers. Since these bollards are all unjustified, the County is putting itself at risk by installing them. 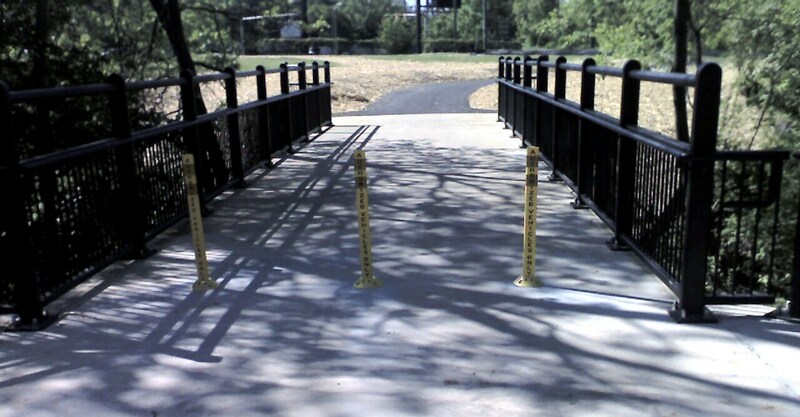 For these and other reasons, the W&OD trail removed all its bollards more than 15 years ago. They do occasionally experience encroachments, but have determined that the hazard risk imposed by the bollards is too great to justify their presence. I hope that Arlington will also adopt a similarly enlightened attitude.